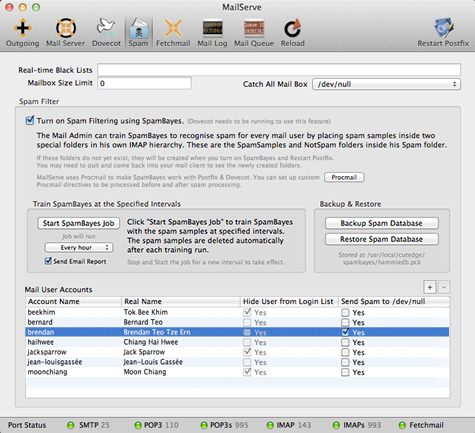 The Spam Panel includes controls for managing spam and setting up user accounts. This field allows you to list RBL (Real-Time Black Lists) sites that you want your server to check against. If you have more than one, you should separate them by commas. Such sites include bl.spamcop.net, sbl-xbl.spamhaus.org, cbl.abuseat.org, etc... You can choose from among a lot more if you search Google. Set to 0 for no limit, which may be useful for people running Fetchmail. The default is about 50 MB. You can choose who, among your users, gets to be swamped by mail that cannot find a valid user on your server. If you elect not to nominate anyone, all these messages will be bounced back to the sender. Or sent into the black hole, if you choose /dev/null in the popup menu. MailServe can turn on Spam Filtering using SpamBayes with just one click. The mail administrator will find two special folders in his Spam folder (created by MailServe) – one for spam samples and the other for false positives. A SpamBayes training job runs at set intervals, using the samples the administrator has placed into his training folders. The administrator trains SpamBayes on behalf of all the other mail users. Each time the training job runs, SpamBayes gets better at recognising spam. The spam samples are deleted automatically after each training run (but not the false positives in case they are still needed for filing). Please note that MailServe's spam fltering mechanism needs Dovecot to be running. 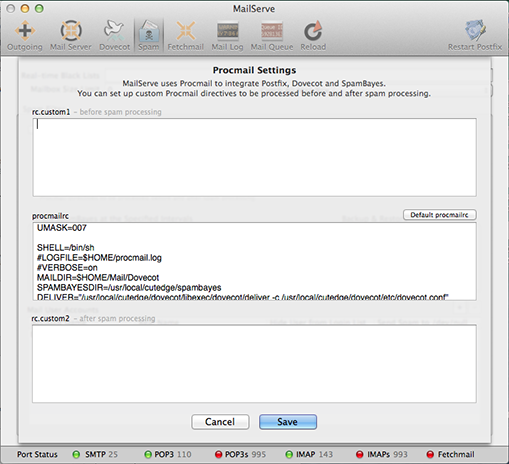 MailServe uses Procmail to integrate Postfix, Dovecot and SpamBayes. There is a Procmail button in the Spam Panel that will allow the administrator to set up custom Procmail directives to be processed before or after spam filtering. The administrator can also edit the default procmailrc directives, with the option to revert to default if the custom edits do not work. 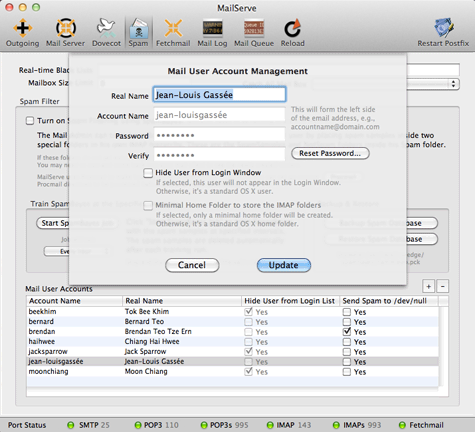 The Spam panel contains a Mail User Management utility, which allows the administrator to create or delete mail users, set passwords, and decide if they are to be standard OS X users, or users with a minimal home folder (to store the IMAP folders) who are hidden from the OS X Login Window. The administrator can also decide for each user if his spam mail will be deleted right away (sent to /dev/null) or continue to be collected in the spam folder. I'm using the example below to show that the entry fields allow you to enter diacriticals and umlauts, etc., for the user name and the OS X short name (the account name), though not for the password field.